Home / Blog / Rebalancing needed in the pharmaceutical sector! 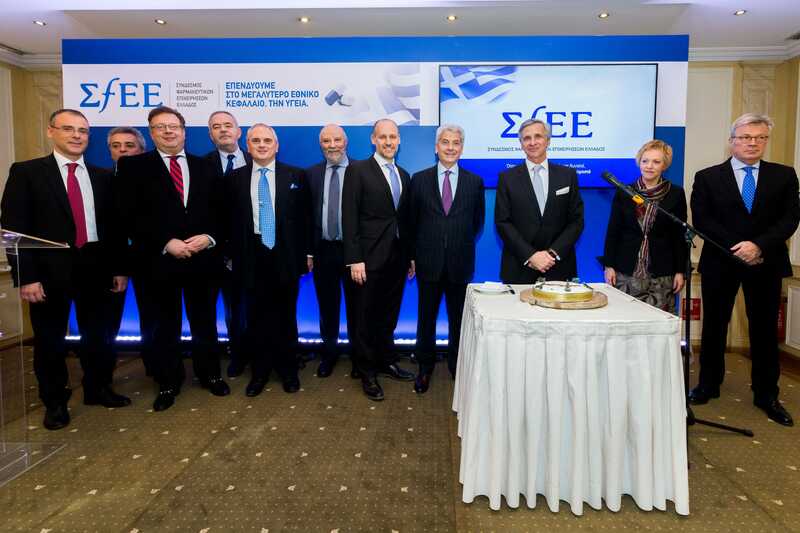 Athens, 24 January 2018 – On Tuesday, 23 January 2018, SFEE held its New Year Cake-cutting ceremony at Aigli Zappiou, Athens, attended by representatives of the State, institutional bodies and high-rank officials from opposition parties and the health sector. 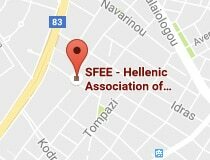 Looking back on the past year, SFEE President Mr. Pascal Apostolides, said that 2017 was a lost year, with missed opportunities and without substantial reforms, while at the same time noting that the pharmaceutical industry and Greek patients have been witnessing the enactment of several dangerous healthcare policies, which are a cause of great concern for both of them: industry is threatened by exhausting taxes, and patients face difficulties in their access to innovative therapies. Highlighting the despair of pharmaceutical companies, which can take no more after the unprecedented burden that has fallen upon them, Mr Apostolides stated: “Our contribution to financing total pharmaceutical expenditure is over 30% or four times the European average. Moreover, we paid EUR 165 million in rebates and claw-back, covering the cost of care for 840,000 uninsured fellow citizens. Meanwhile, the pricing model has used up its scope for savings and merely perpetuates distortions, resulting in the withdrawal of 240 medicines from the market. Last year we spent valuable time and energy on redistributing clawback and raising rebates rather than on real reforms. 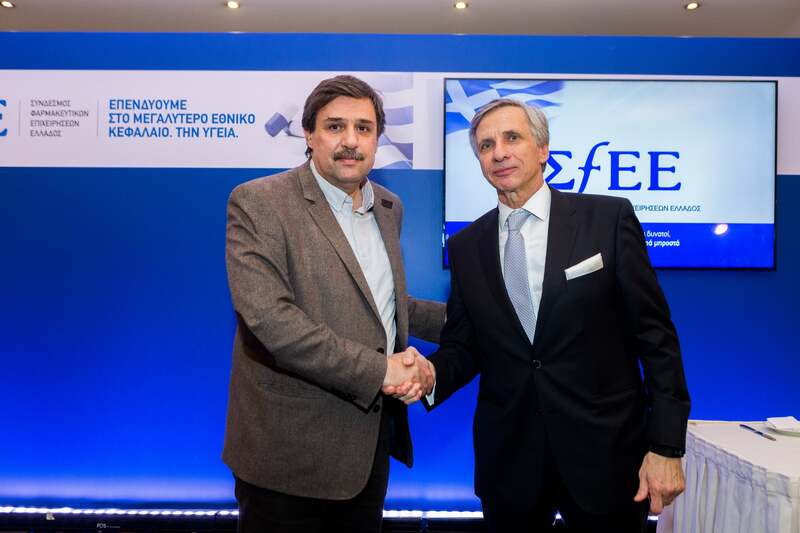 SFEE President Mr. Apostolides also took this opportunity to point out the leading role of the pharmaceutical industry as the country’s second largest exporter and its potential contribution to the new growth model of extroversion and innovation that Greece needs, but also to reversing brain drain by creating high-skill jobs, provided that investment- and growth-friendly strategies are adopted. 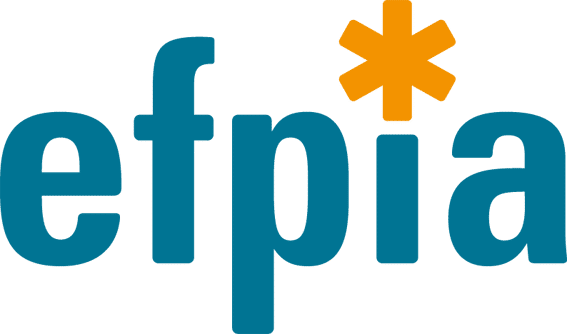 In concluding, Mr Apostolides repeated once again that SFEE is on the side of the State in the quest for solutions that will bring about a rebalancing and deliver a viable, well-functioning and effective Public Health System which fully respects patients’ needs and safeguards their rights with a sense of responsibility and commitment. In his address, the Minister of Health, Mr Xanthos, noted: “2018 will be a milestone year, when the country will sustainably break out of the vicious circle of austerity and tight fiscal surveillance. This will give us more degrees of freedom to organise healthcare policy and government policy in general, based on the real needs of society rather than on arbitrary budgetary targets.” Mr Xanthos acknowledged that the policiy implemented in the last 7-8 years has caused distortions, problems and side-effects and that has exhausted its limits without producing any positive results, having led, especially in the area of pharmaceutical care, to a breaking point and multiple deadlocks. “Our intention is therefore to pursue those feasible corrective actions that will signal that the cycle of risk in this very sensitive sector has closed, that there is more predictability and, above all, that now we are not promoting across-the-board measures but we are trying to speed up crucial changes and structural reforms”, said the Health Minister. Brief addresses and wishes for the New Year were also delivered by: Mr Vassilis Oikonomou, New Democracy MP, shadow health minister; Mr. Kostas Bariotas, Democratic Alliance MP, responsible for healthcare; Mr. Vassilis Leventis, President of the Union of Centrists party; Mr. Theodoros Tryfon, President of the Panhellenic Association of Pharmaceutical Industries (PEF); Mr Sotiris Bersimis, President of the National Organisation of Healthcare Services (EOPYY); Ms Katerina Antoniou, President of the National Organisation of Medicines (EOF); Ms Elena Houliara, Secretary-General of the Pharma Innovation Forum (PIF); Mr George Patoulis, President of the Athens Medical Association; Mr Thanasis Papathanassis, Vice-President of the Panhellenic Association of Pharmacists; Mr Antonis Avgerinos, President of the Hellenic Red Cross; and Mr Giorgos Kalamitsis, President of the Liver Patient Association “Prometheus” and Chairman of the Committee for the Rights of Patients.